The Antena family of channels increased its market share numbers during the first semester of 2017 on all targets, respectively 18-49, urban and national, compared to the same period of last year. Moreover, the group’s TV stations led the market during Whole Day, Day Time, Access and Late Fringe on the urban target and during Day Time and Access on the national target. Antena 1, the flagship entertainment channel, home to the largest star system in Romania, consolidated its Prime Time and Late Fringe market share numbers on the commercial target. The first half of the year showed market share appreciation by 5% during Prime Time and 15% during Late Fringe, while audience numbers grew by 11% during Late Fringe on the 18-49 target, compared to the same period of last year. Topping the audience charts in June, the productions Insula Iubirii (Temptation Island) and Te cunosc de undeva (Your face sounds familiar) proved yet gain their value to the public. 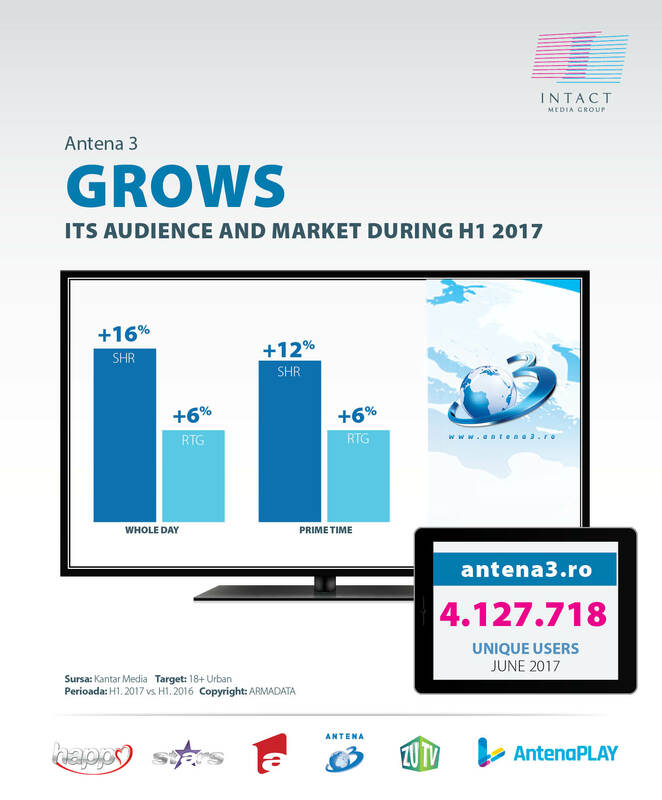 Antena 1 was watched in June, during Whole Day, for at least one minute, by 7,5 Romanians, whilst www.A1.ro had more than 4.2 million unique users. 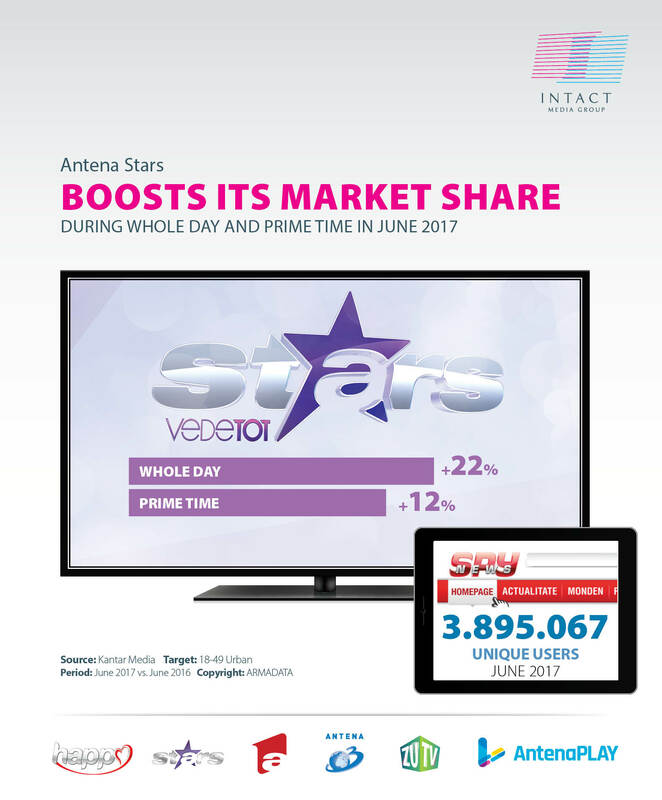 Antena Stars, the only TV channel dedicated to showbiz, had significant market share growth during June, including during Whole Day (+22%) and Prime Time (12%), on the urban commercial public. The highest market share evolution was scored during Late Fringe (+81%). Moreover, the Late Fringe interval doubled its audience numbers as compared to June 2016, while consolidating both its audience (33%) and market share (25%) versus last year’s first semester. Over 3 million Romanians watched Antena Stars in the first half of the year, during Whole Day, for at least one minute. The most popular productions were “Agenția VIP“, “Dincolo de aparente” and “Alege dragostea”. Happy Channel, the Group’s TV station addressed to daring women, had market share (+25%) and audience (+20%) appreciation during Prime Time compared to the first half of 2016 (Target 18-49 Women, Urban population). The most popular series of the station included the series “Elif”, “Elita societatii” (High Society) , “Sezonul cireșelor” (Season of cherry), “Tata de fetita “ ( Baby Daddy). ZU TV, the station addressing the young public (15-34 urban) consolidated its market share in June during prime-time (17%) and daytime (11%), compared to the same period of last year. The channel captured the audience’s attention with shows such as “Forza ZU”, “Miezu”, “Most Wanted”. Antena 3 is the leader of the news niche in Romania in the first semester of the year on the most important time slots, amongst which Whole Day and Prime Time, scoring at the same time audience and market share appreciation, compared to the same period of last year. As such, the audience appreciated by 6% during Whole Day, and by 12% during Prime Time. Moreover, the first half of the year saw audience and market share appreciation on all time intervals, compared to the same period of 2016. Antena 3 was watched in June by more than 3.6 Romanians every day, on the National level. “Subiectiv”, “Sinteza Zilei”, “Adevăruri ascunse”, “Voi cu Voicu”, ”Exces de putere” topped the audience charts. On the digital front, Antena3.ro had more than 4,1 million unique users in June. In the first semester of 2017, Digital Antena Group was the only publisher in Romania with three of its sites in top 15 all sites in .ro, according to the official ranking (BRAT): a1.ro, spynews.ro and antena3.ro, which were also on the first positions in their categories. A1.ro was undisputed leader each month, outclassing its competitors – protv.ro and kanald.ro in the entertainment category. A1.ro was also the only website present each month in top 10 websites in .ro, with an audience more than double compared to the competition. Spynews.ro is leader in terms of monthly views, with more than 30 million views in the last three months. Antena3.ro was each month in top 3 News and Analysis category and observator.tv had an organic growth, reaching more than 2 million unique users in June. The group’s dedicated channels on Youtube are constantly in top most watched videos, with thousands subscribers and the Facebook pages permanently delivering interactive content for the audience. AntenaPlay.ro had an excellent first semester. The number of subscriptions is on an ascending trend, compared to the same period last year, and for the next period the focus will be on generating special content from Antena 1’s productions, content not available on TV. 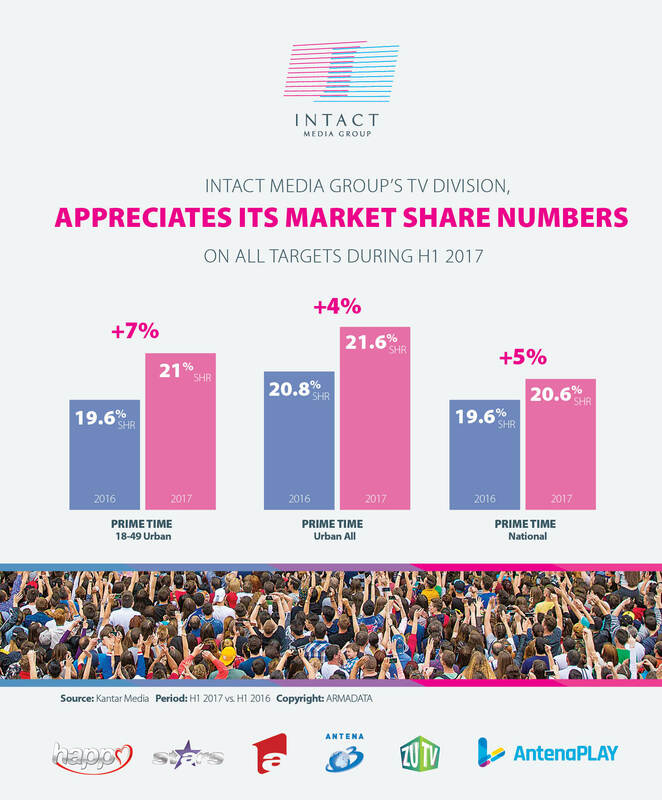 Over 8,6 million Romanians watched Intact’s family of TV channels in June during Whole Day, for at least one minute, on national level, while 5,8 million were reached during Prime Time.